Aerogel helped enhance warmth and daylighting in the Eielson Air Force Base. The location of the Eielson Air Force Base is extreme and remote. Deep in Alaska's interior, temperatures at the base reach to -50 °F (-10 °C). Here, the United States 354th Fighter Wing maintains, trains, and conducts close air support and interdiction efforts in three different theaters of operation. As with any military force, keeping the 354th in shape both physically and mentally is critical because of the long winters and the amount of time personnel spend training indoors. With the weather forcing up to 4,000 personnel into the outmoded Baker Field House from September through March, the Air Force opted to build a 60,000 foot2 fitness center. This offers amenities such as an outsized exercise field of artificial turf, offices, restrooms, and a 1/8 mile-long elevated running track. Super-insulating Kalwall with LUMIRA® aerogel was included in the center's design by Alaskan firm USKH Inc. to address a scarcity of daylight. 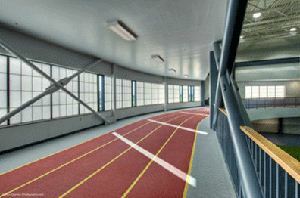 In addition to saving energy, the translucent system bathes the track, indoor sports area and weight-lifting rooms with controlled natural daylight. The use of artificial lighting is reduced, conserving electricity while Kalwall's shadowless, glare-free light makes ball handling easier in team events. When it comes to keeping the sub-zero temperatures outside, the 354th Fighter Wing is nothing short of amazed. Even on the coldest days, the interior surface of the Kalwall + LUMIRA aerogel cladding is warm to the touch. The panels' ability to transmit natural daylight, even on the gloomiest days, while offering a U-value of 0.05 Btu/hr/ft²/°F (or 0.3 W/m²K), approximating that of a solid wall, means the fitness center meets LEED® Silver requirements.